The interior ministry said security forces hunting down Islamist terrorists in the region were attacked late Friday on a road to the Bahariya oasis, some 200 kilometres (125 miles) southwest of Cairo. Cairo, Egypt: At least 35 Egyptian police officers have been killed in an ambush by Islamist fighters near the Bahariya oasis in the country's Western Desert, security and medical sources said Saturday, in a rare flare-up outside the Sinai Peninsula. An official statement said a number of the attackers were killed, but did not give any figures for losses on either side. There has not yet been a claim of responsibility. A fake claim in the name of the small extremist group Hasm, reported by multiple local media, spread on social media soon after the attack. Since the army removed President Mohamed Morsi, of the Muslim Brotherhood, extremist groups have increased their attacks on the military and police. Authorities have been fighting the Egyptian branch of the ISIS group, which has increased its attacks in the north of the Sinai peninsula more than 500 kilometres (300 miles) away from the latest violence. In response to the latest bloodshed Egyptian security forces appeared to step up their operations in the area of the attack. Two truck drivers heading away from the scene told AFP they had seen heavy deployments of security personnel in the area and that aircraft were carrying out surveillance. In the face of the latest violence, President Abdel Fattah al-Sisi on Saturday was sticking to a plan to mark the 75th anniversary of the pivotal victory by the Allies in the World War II Battle of El Alamein at a ceremony involving foreign dignitaries on Egypt's Mediterranean coast, his office told AFP. But the strongman leader cancelled all his other engagements for the day. The Muslim Brotherhood, once Egypt's largest opposition movement, has long denied involvement in the attacks on the authorities. Mohamed Morsi was elected as Egypt's first civilian president in 2012, but the army overthrew him a year later following mass protests against the Islamist's divisive rule. Since then, an extensive crackdown on the group has left it in disarray with competing wings that have disagreed on whether to resort to violence, after police bloodily suppressed their protests. Hasm has claimed multiple attacks since 2016 on police, officials and judges in Cairo. In their statements, none of the militant groups claim any affiliation to the Muslim Brotherhood. Hundred of soldiers and police have been killed in the grinding ISIS group insurgency in the Sinai Peninsula in the far northeast of the country. 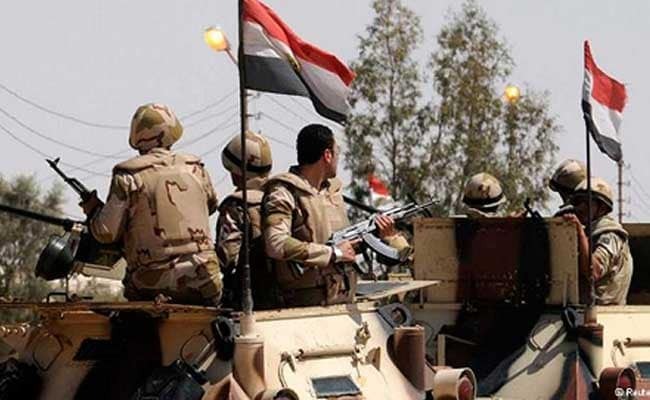 On October 13, the Egyptian army said six soldiers were killed in a "terrorist" gun and grenade attack on a security post near the North Sinai provincial capital of El-Arish. ISIS has maintained a steady war of attrition with sniper attacks and roadside bombings. But unlike their parent organisation in Iraq and Syria, they have been unable to seize population centres in the peninsula, which borders Israel and Gaza. In October 2015, ISIS claimed the bombing of a Russian airliner carrying holidaymakers home from the popular South Sinai resort of Sharm el-Sheikh, killing all 224 people on board.